Today’s photos come from Kate McMillan’s 50-foot by 100-foot city lot in Portland, Oregon. I planted for privacy and structure first. Before I got into the (often more interesting and beautiful) details, I established the privacy screens we wanted with trees and large shrubs. To get the variety I wanted, rather than a continuous hedge of one plant, I used various, primarily evergreen, columnar plants along the fence line, which act as a wonderful backdrop for the plantings in front. I made sure to include various gathering areas. Even though my back garden is small, it has spaces for dining with friends and lounging in the shade. Dividing up the small space has made it feel bigger and more functional for our needs. 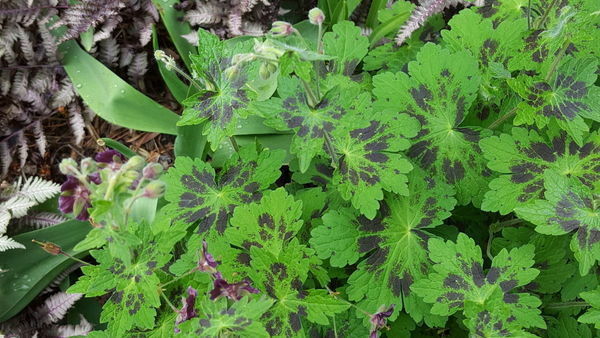 I use ground cover and color to unite all my plantings, even though I split the garden into distinct areas. 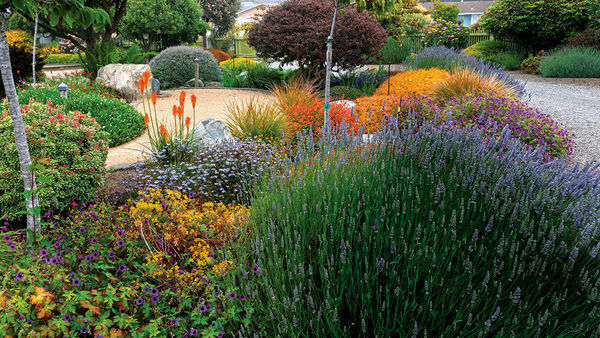 Doing this also lets me grow lots of different plants without everything feeling too jumbled, because there’s a continuous through-line of things like glaucous and purple foliage. I don’t want to be limited to a smaller palette of plants (despite having a smaller garden), because I love plants too much! I garden in the front for my community. 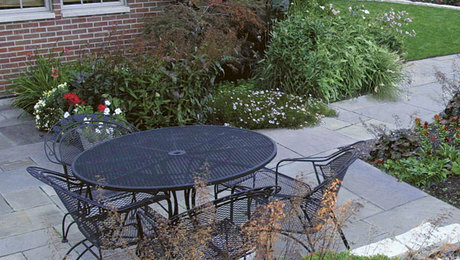 Despite adding privacy in the back and along the sides of the house, I kept things low and inviting in the front garden, and I regularly connect with the neighbors while I’m out there gardening. I feel like this contribution to the neighborhood, and a better relationship with my neighbors, makes my city garden (and my home) more enjoyable for me, too. 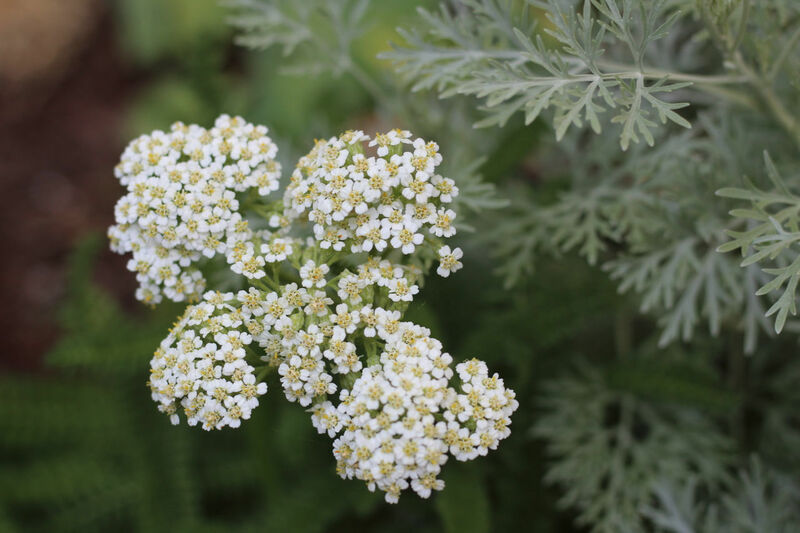 I like Sonoma Coast yarrow (Achillea millefolium ‘Sonoma Coast’, Zones 3–9) because it’s relatively compact for my smaller garden, along with silver foliage from Artemisia ‘Powis Castle’ (Zones 4–9). 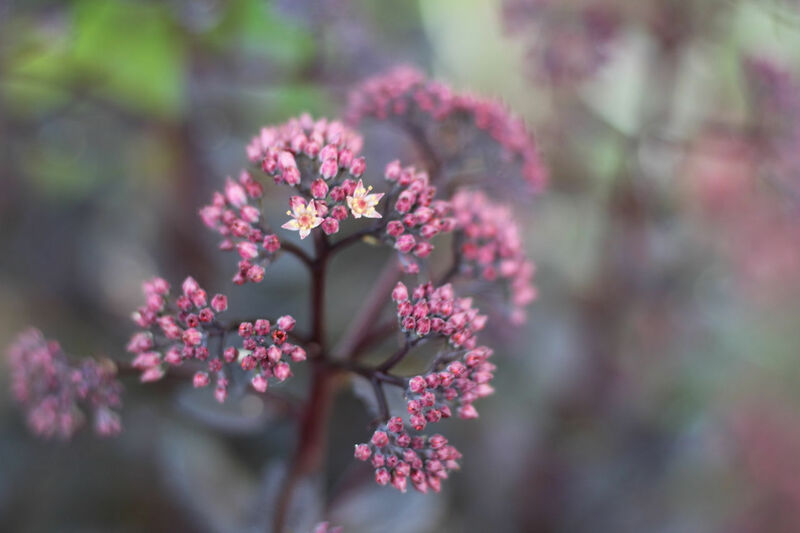 This Sedum ‘Touchdown Teak’ (Zones 4–10) is just beginning to open its flowers. 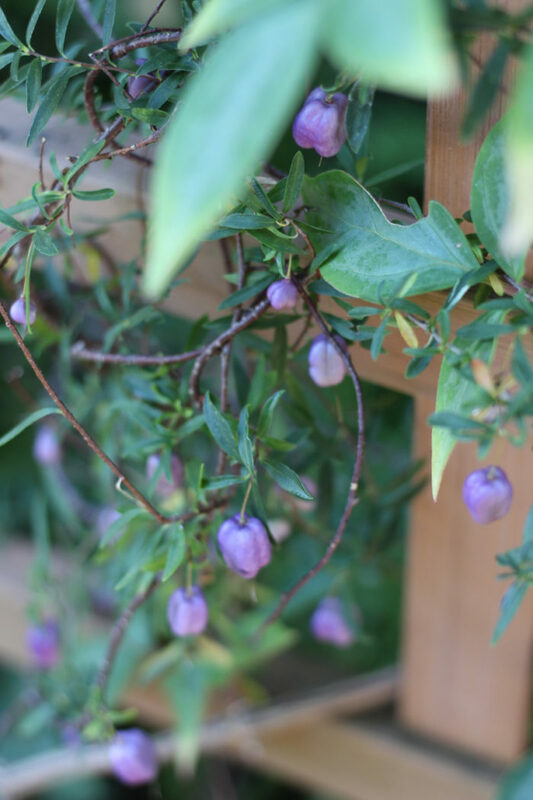 Purple apple-berry (Billardiera longiflora, Zones 8–9) with purple fruits shares a trellis with Clematis fasciculiflora (Zones 7–9), which flowers in winter. Palmer’s sedum (Sedum palmeri, Zones 8–10) with ‘Tiny Rubies’ dianthus (Dianthus gratianopolitanus ‘Tiny Rubies’, Zones 3–9) and ‘Cape Blanco’ stonecrop (Sedum spathulifolium ‘Cape Blanco’, Zones 5–9). 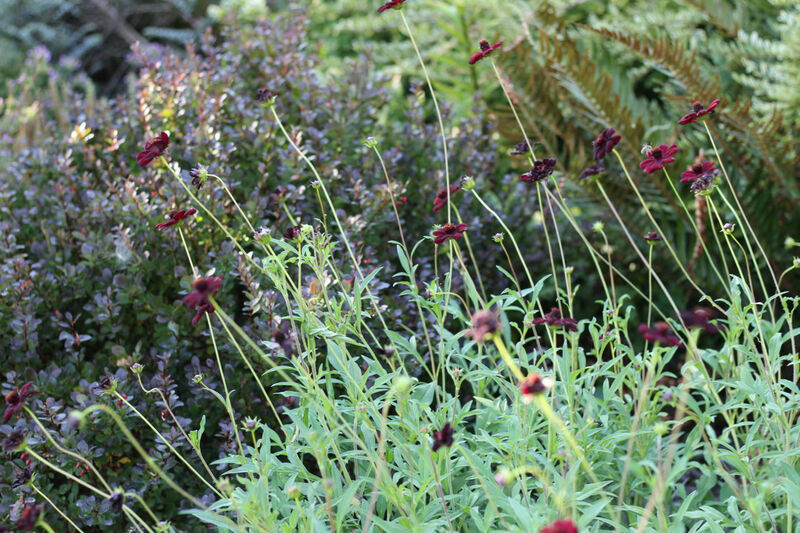 Chocolate cosmos (Cosmos atrosanguineus, Zones 8–11) with a backdrop of Japanese barberry (Berberis thunbergii ‘Crimson Pygmy’, Zones 5–9) and western sword fern (Polystichum munitum, Zones 5–9). 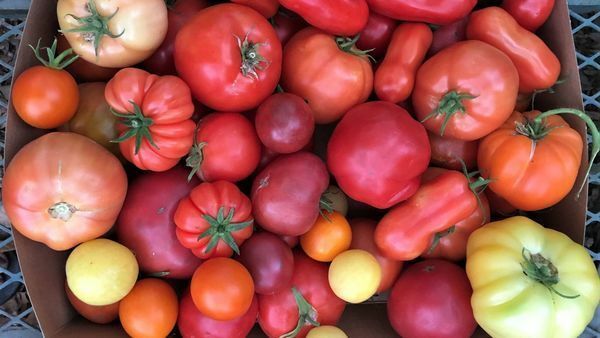 I enjoyed your post, photos, and appreciate your garden philosophy. I'd like to see more photos which include your evergreens and how they work in your garden. Thank you! Oh, my, I have never heard of apple-berry. How pretty! 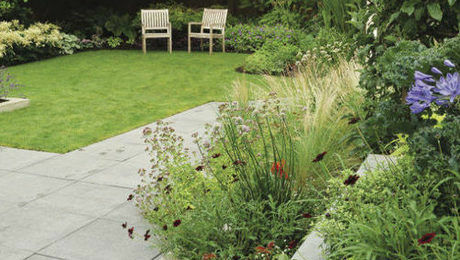 Could you share more showing a long view of your back yard? 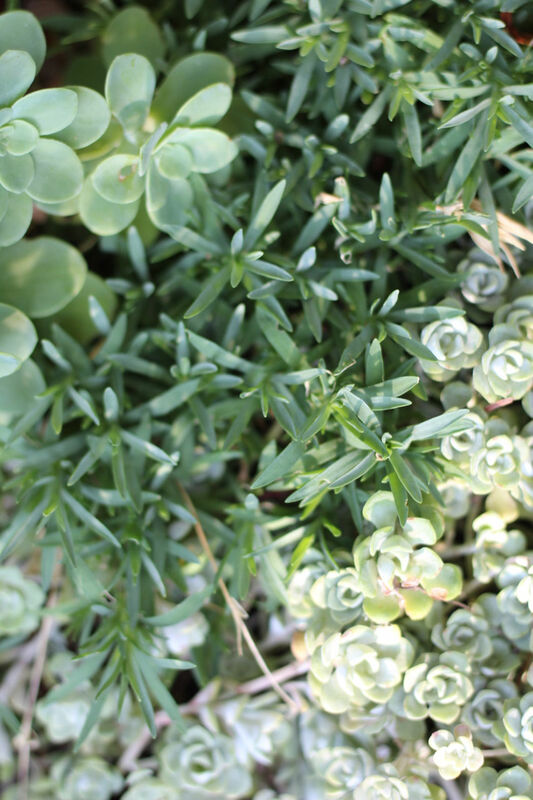 Hi, Kate, I love the plant selections you've shared in the photos and, like Maggieat11, I would also enjoy seeing some shots that include the bigger picture of how the evergreens frame your backyard and the shape of your beds. I'm sure it would be very inspiring. Hello Kate, I'm going to echo everyone else. You have really inspired and tempted us with your beautiful photos spotlighting some individual plants. Now I'm holding my breath, waiting for a more over all view of the whole garden! Kate Your photos are breathtaking! I really loved seeing all of your photos and vignettes. Have you heard of the Shared Garden Visions Facebook page? It is a group of enthusiastic gardeners that post photos to a private Facebook group. It would be lovely to see you post more of your photos there. 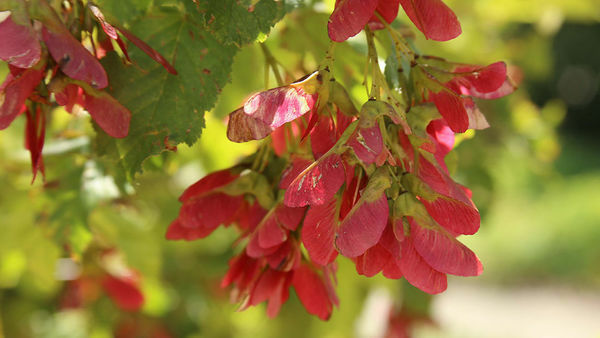 We are an enthusiastic group of gardeners, and we welcome more of the same! A lovely little gem of a garden! Have never seen the purple apple berry before and will look into whether I can grow it here in NC. Beautiful! I, too, would like to see more of your garden, especially the measures you took for privacy. Although our property is fairly large, we still have some need of screening, etc. Thanks for showing some things very new to me. Hi All -- thanks for the nice words! You can follow me & see more garden photos via my Instagram feed @cultiverity.